Er, since when has minor Mozart and Beethoven chamber music had anything to do with the North German organ!? This is the kind of mistake you can understand being made with computers but I'm surprised to find it from the days of cutting, pasting and typesetting by hand. Anyone else come across anything similar? 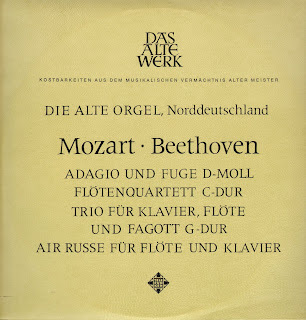 Side 1 contains the first of those string trios based on fugues by Bach and attributed (less and less securely, it seems) to Mozart as K.404a, and the Flute Quartet in C K.285b, both played by members of the Alma Musica Sextet. I already knew of this side from its first issue on a nice 1955 LP entitled 'The Golden Line of Polyphony', London/Ducretet-Thomson DTL 93046, but that's a rarity and this Telefunken pressing (I don't have a date for it) seemed minty-mint, so I was looking forward to sharing it with you. As I'm getting to be more and more of a Rampal fan (I've been buying the outstanding reissues of his early recordings on Premiers Horizons, the label of the Association Jean-Pierre Rampal - they're cheap, too, get them! ), I was chuffed to see that Side 2 apparently contains Beethoven's Trio in G WoO 37 for flute, bassoon (Paul Hongne) and piano (Robert Veyron-Lacroix) and the Air russe, No.7 of the 10 National Airs with Variations Op.107 (also with Veyron-Lacroix). I think these must be the recordings listed by the Bibliothèque nationale as first issued on Ducretet Thomson LPG 8002 (dépôt légal 1952), not the mid-1960s ones made for the Club français du disque and now available as part of a complete set of Beethoven's chamber music on VoxBox CDX-5000. But I was a smidge surprised to find that Side 2 is merely a repeat of Side 1, though for some reason the Bach/Mozart string trio was mastered at a slightly higher level! The two sides have different labels and matrix numbers, as expected. Anyone know how this might have happened? - Carel van Leeuwen Boomkamp (cello - Anner Bylsma's teacher; here's a biog in Dutch). I won't pretend Alma Musica was the best ensemble ever, even of its day, but I admire its pioneering spirit and programming. In fact, this makes me really grumpy: if a small label can put out these Ristenpart gems at such a reasonable price, why can't we have them all? A big Ristenpart box from EMI, which now owns the outstanding Discophiles français catalogue? Or, better still, a complete Discophiles français Edition!? Thanks for these wonderful pieces, they fill my house with beautiful music. Almost 3 years later (!) I have acquired a copy of this LP. with a different sleeve and it does have the Rampal tracks on side 2. My copy has the maker's number AWT9430-C. Does anybody know if there was a stereo issue? Coincidentally I acquired a copy of the Alma Musica Sextet LP "Instrumental music from Willaert to Mozart" on Telefunken LT 6551 which is a reissue of the Ducretet-Thomson LP and has the Mozart works which comprise side 1 of the Alte Werk LP. Hi, Thanks for dropping by and well done! Your number is the same as mine - I guess mine is a faulty pressing, possibly the first? Faulty printing, too - I assume your copy's sleeve doesn't mention the organ!? I've not been able to find a stereo issue - I doubt there was one: surely the Alma Musica items are too early, though the Rampal items may have been recorded in stereo (if they are the versions issued on Turnabout and Vox). In the meantime, I found a copy of 'The Golden Line of Polyphony' I didn't even know I had! Yes, I think you're right, it must be a mono only issue. And yes, my sleeve doesn't mention the organ music. Very odd, as you say that nobody noticed the anomaly. There is another copy of the LP with your sleeve on offer on eBay at the moment but the bloke wants 29 Euros for it so my investigation will pause here. For information the matrix numbers on my copy are LP 069 359 for side 1 and LP 069 360 for side 2. Interestingly the leaflet inside SAWT 9436 has as its title Die Alte Orgel Norddeutschland. I wonder if the same graphic artist was tasked with making the sleeves for both these LPs and got a little mixed up. After 36 and 30 can look quite alike in handwriting. But it's still bizarre and unGerman that the error crept through. Another two years further on...the number of the Rogg box set is just SLS 801, the "2" refers to the number of discs in the set. There is an SLS 802 which is a collection of the 5 Saint-Saens piano concertos. Aha. It's just that none of the other SLS (or RLS) boxes I own, or any I can remember seeing, use that notation.